On this page, you’ll learn all about Sansar and how to convert Marvelous Designer clothes to Sansar clothes. You’ll discover how to fit Marvelous Designer clothes to Sansar avatars, how to texture and render Marvelous Designer clothes for Sansar, how to sell clothes on Sansar, how to avoid and troubleshooting common simulation and conversion issues from Marvelous Designer to Sansar. 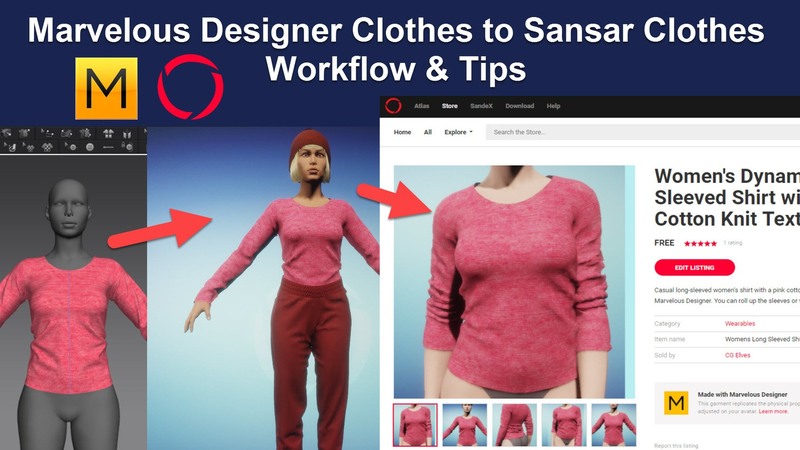 You’ll also learn about the current issues with converting Marvelous Designer garments to Sansar clothes, what not to do, and what to do to avoid common issues. What is Sansar and why turn your Marvelous Designer clothes into Sansar clothes? According to Forbes, Sansar is the world’s leading social VR platform created by LindenLab. In a nutshell, people customize an avatar, dress it, and use it to visit virtual events and live virtual lives. LindenLab’s previous successful creation was Second Life (a virtual game world, also known as SL or 2nd Life). Launched in 2003, SecondLife has millions of users, a $500 million dollar user-to-user economy, and nearly 2-billion user creations. Around $250 million dollars were made by SecondLife sellers from selling avatar related accessories such as hair and clothing. Check out these inspiring and Amazing Second Life Creator Success Stories by creators who earn a full-time living off selling assets on SecondLife. The Sansar marketplace is a wonderful opportunity for Marvelous Designer users to earn extra income by selling clothes to Sansar users. Creating clothing for Second Life was time-consuming and difficult for most Marvelous Designer users. The new Marvelous Designer to Sansar bridge enables Marvelous users to quickly create simple clothing for sale in the Sansar marketplace. After creating clothes in Marvelous Designer on a Sansar avatar, simply import your Marvelous Designer clothing into Sansar. The clothing gets auto-rigged by Sansar for their Sansar avatar. No manual rigging needed! 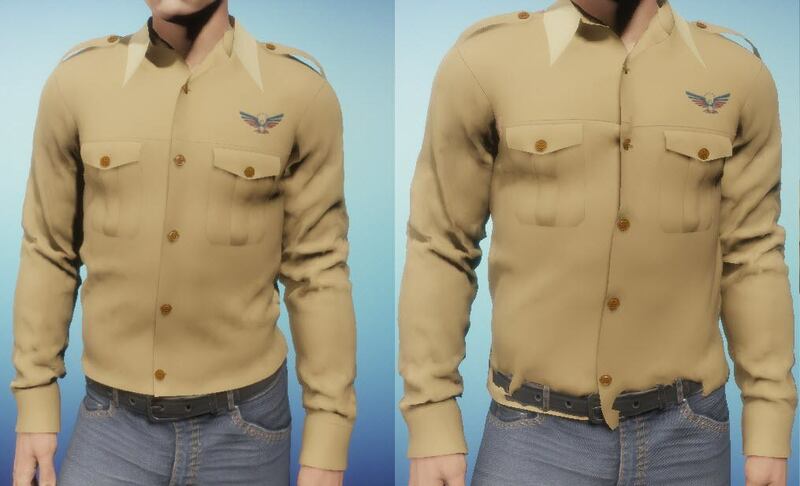 Sansar users who buy Marvelous Designer clothes instead of normal rigged/conforming clothes, are able to dynamically simulate the clothes in Sansar’s Lookbook and make small adjustments such as roll up sleeves or pant legs, lift or lower collars, arrange wrinkles, layer clothes etc. 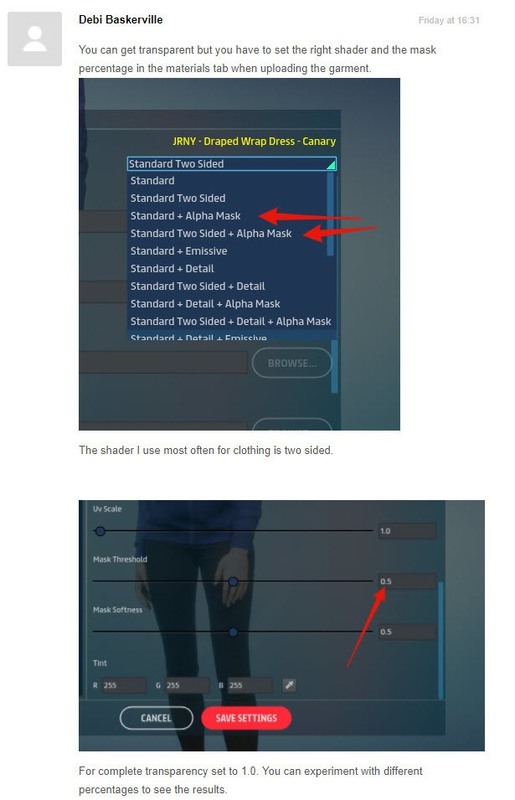 While Sansar users can adjust the clothes on their avatar in their Lookbook, the moment they exit the lookbook, the clothes become conforming like all other clothes. Sansar currently does not support dynamic clothing simulations in-game. What kind of Marvelous clothes can you create for Sansar? The best clothes to make for Sansar using the Marvelous Designer to Sansar bridge are simple skirts, pants, shirts, jackets without any fine wrinkles, tiny frills, lace, layers, ribbons, or fine gathers. Currently, Sansar auto rigging feature has it’s limitations and issues. Very complex Marvelous Designer clothes do not fair too well in the Sansar simulation. Sansar automatically rigs sleeves, skirts, and pants to the avatar’s body. Whatever part of the clothing is closest to the body gets rigged to it. While Sansar’s auto-rigging works fine for tight clothing, it doesn’t always work too well for loose clothes or clothes with a lot of fabric. Garments which have very wide flared sleeves, flared pants legs, or skirts with a lot of fabric, tend to be distorted when auto-rigged by Sansar. When the avatar moves a leg, the fabric gets stretched in queer ways along with any texture applied to it. Fabric which touches sometimes gets auto-rigged together. For example in images 1 and 3 below, the bottom of the pants legs touched and therefore got rigged “stuck” together so when one leg moves, both pants bottoms get stretched together in strange ways. In image 2, you can see an issue which occurred when there was a lot of loose fabric on the sleeves. The sleeves get all torn up in Sansar and penetrate into the dress (I guess Sansar isn’t sure if the sleeves are part of the dress and should be rigged to the body or should be rigged to the arms). The clothing which works best for Sansar are clothes which aren’t too loose and fit closely to the avatar’s body. 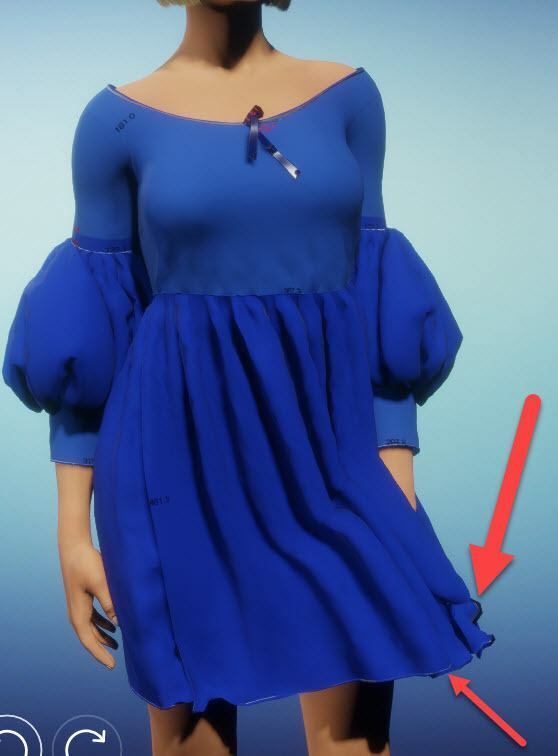 When making Sansar clothes in Marvelous Designer, make sure things such as loose sleeves don’t touch other parts of your garment. Sansar’s system greatly reduces the quality of the Marvelous Designer clothes to make them game ready. All the tiny, fine wrinkles, gathers, frills made in Marvelous Designer at Particle Distance 5 or 8 are reduced greatly (often to such an extent they no longer look nice or are no longer visible). Clothes which were created at Particle Distance 5 in Marvelous Designer end up looking like they were created at Particle Distance 10 or 15 once imported into Sansar. Sansar’s system does not like too many layers. Simple things like pockets and rolled back hoods are fine. Decor which is firmly sewn down is usually OK too, however, knots and knotted belts tend to open up. Simple ribbons which are sewn down well are OK in Sansar simulation, however, ribbons or knots which are tied and folded with layers can cause problems. Create simple clothes in Marvelous Designer at Particle Distance 10 or 15. If they look good in Marvelous at that particle distance, they will look good in Sansar. Avoid making clothes with many layers, with piping or other tiny, fine detail as that will be lost in Sansar. Modelling your clothes in Marvelous Designer at PD 5 is useless. It takes longer to upload and convert the garment to a Sansar garment and all the PD 5 detail gets lost anyway in the conversion. Once a clothing item is listed in the Sansar marketplace, you can no longer change its texture. An easy way to increase your chances of being discovered in the Sansar marketplace and sell many clothing items, is to simply change the texture on your garment and then list it for sale again in the Sansar marketplace as a new clothing item. However, for more complex clothing, if you know how to use other 3D programs to do retopology, texturing, and rigging etc., I recommend you don’t use the bridge. Instead, texture and rig the clothes as you would for games/DAZ 3D/ Poser/Reallusion etc. Export your Marvelous Designer high poly clothes to your other 3D programs. Sculpt extra details if you want (add fake pockets, decor, stitches etc). Texture your clothes nicely in Substance Painter or whatever texturing program you use. Create low-poly clothes for Sansar with normal maps which have all the fine wrinkles and detail from the Marvelous clothes. Rig your clothes to the Sansar avatars and then sell the game-ready clothes in their marketplace. Creating and rigging clothes manually is the best way to get beautiful, professional looking clothes. You control the mesh density and add more polys where you need more detail. You control the final look of the clothes since you create the normal maps and add the wrinkles and the details where you want them. This process, of course, takes longer than using the bridge but you get the best results. Using the MD to Sansar bridge you can create simple clothes fast, but you don’t have much control over the final look of the clothes (plus there are still some bugs with the bridge), and you won’t get hyper-realistic, detailed, really awesome looking clothes. Currently, as of Marvelous Designer version 3.2.1.20, Marvelous Designer has included the 2 base Sansar avatars. However, these avatars are not rigged and do not have any Xray joints. This means, they cannot be posed and their limbs can’t be interactively moved. This is a big issue when fitting other garments you made on other avtars to the Sansar ones, or even for creating new garments on these frozen avatars. For instance, I always lift arms up out of the way when I drape skirts (otherwise the skirts get stuck in the hands). Anotehr example: Most of my clothes were modeled on the default MD avatars which stand in A-pose with straight arms. Sansar avatars have slightly bent elbows. So, long story short, until MD adds Sansar avatars which have Xray joints, I recommend downloading the rigged avatars directly from Sansar instead. Official Sansar avatar for Marvelous Designer documentation. Tutorial How to Convert Marvelous Designer Clothing to Sansar Clothing and Sell Your Clothes in the Sansar Marketplace. Tutorial How to Convert 1 Marvelous Designer Skirt to 10 Sansar Skirts and list them all for sale in under 30 minutes. UPDATE: Vintorix found a way to solve the transparency textures issue! See the FAQ section further down. Once you import a Marvelous Designer garment into Sansar you can no longer change the textures on the garment in Sansar. So if you want to sell the same garment with multiple textures in the Sansar marketplace, you need to change textures in Marvelous Designer and then import the newly textured garment into Sansar and list a new product. Below are some tutorials how to change textures on clothes in Marvelous Designer. Note: Sansar does not support any transparency on fabrics! You can add 2D graphic overlays with transparency (such as PNGs of brand names, logos, or images) onto your clothes in Marvelous (as long as they don’t hang off the edges such as lace trims). These images will then be baked into the texture maps when exported to Sansar. Sansar requires a product image and a product thumb for each clothing item you list in their marketplace. You can either export your Marvelous Designer clothes and render them elsewhere (such as in Keyshot, Marmoset Toolbag, Octane etc. ), or if you don’t own a render engine, here’s how you can get a simple render of the clothes in Marvelous Designer. In this tutorial you’ll learn the basics of how to adjust lights, change the Marvelous Designer background image & color, and save out the render image file. If you’d like to get a realistic, professional render of your clothes, check out my Keyshot rendering tutorial. Sansar requires that the product image(s) for your product listing in their marketplace accurately represent the item you are selling. The clothing in Marvelous Designer is often completely different than the final, reduced clothing item after it comes into Sansar. 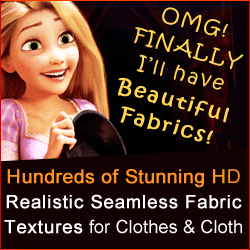 If you render out a nice, realistic render of a high-poly Marvelous Designer garment which has a ton of tiny wrinkles, gathers, lace, etc., that image is deceitful, since the final clothing item people get will be a much lower rez, less detailed item which might not even have any of those small wrinkles and fine details as in your pro render image! 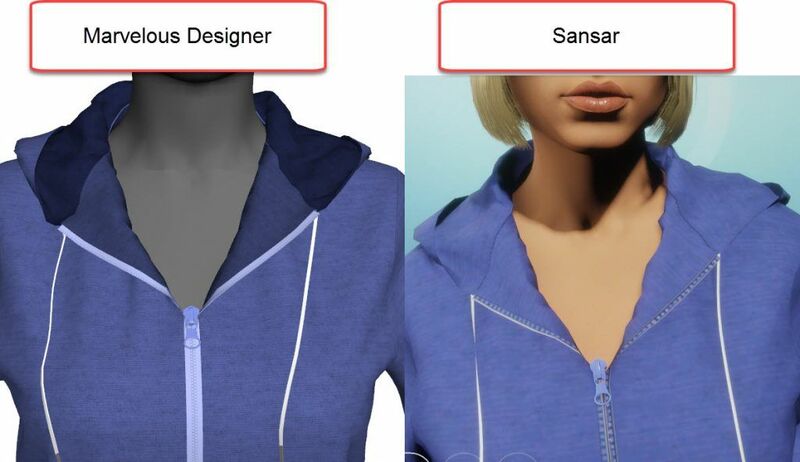 Until you import your Marvelous Designer garment to Sansar and see what Sansar does to it (how much it reduces it and what it looks like in the end) you can’t make a final product image for the marketplace. Now the problem is, once Sansar reduces the garment, you can’t export it back out of Sansar to render it nicely in a professional render engine. Make a decent render in Marvelous Designer of the clothing item. Use that as the clothing’s thumbnail image for the Lookbook in Sansar only. However, when listing the garment for sale in the Sansar marketplace, don’t use that render (unless it really looks like the final garment). Instead, take screenshots of the Sansar garment on the Sansar avatar. 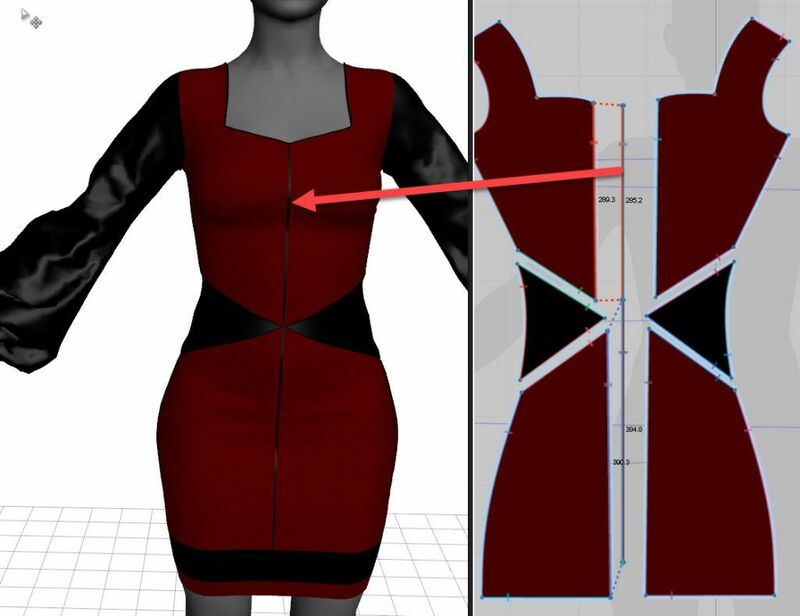 Show customers what the garment looks like from every side and how they can adjust it (pull up sleeves or change wrinkles/fabric gathers) on their avatar. Here are some video tutorial how to scale and fit Marvelous Designer garments to avatars which are much wider, thinner, bigger, taller, or smaller. Using these techniques, you can fit any Marvelous Designer garment you previously made to the Sansar avatars. By applying different seamless fabric textures to your Marvelous Designer clothes before exporting to Sansar, you can create and sell many more Sansar clothes. Each time you apply a different texture to the same garment, you can list it again in the Sansar marketplace and increase your chances of being discovered and of selling more clothing items. 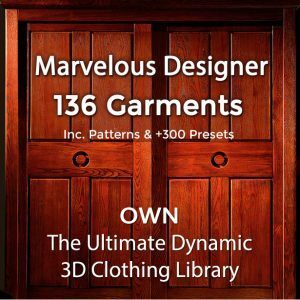 Get a huge library of 300+ beautiful, realistic, seamless fabric textures to texture your Sansar clothes. With our textures, you can quickly create and sell hundreds of Sansar products from each Marvelous Designer garment you make! Q: Why does my Marvelous Designer clothing come into Sansar with line lengths? If you show line lengths on your patterns in Marvelous Designer before exporting to Sansar, those line lengths will be baked into your textures. To avoid this issue, right-click in the 2D Pattern window, and unselect “show line lengths” before exporting from Marvelous to Sansar. Why are there holes and patches of skin coming through my Sansar clothes? Most of the time, skin penetration issues occur in areas where the Marvelous Designer garment is too tight. Before exporting your Marvelous Designer clothes, turn on the “strain map” view and check for tight areas. Areas in red are the tightest parts. Green is loose fabric. 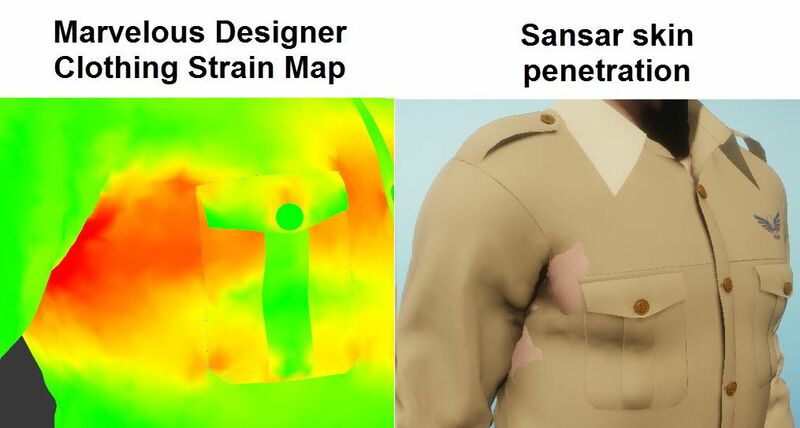 If you run into issues in Sansar simulation of holes in clothes or skin showing through, go back into Marvelous Designer and loosen those tight areas (widen the pattern, add more fabric in certain areas etc.). When I tried to import a Marvelous Designer garment which had transparent fabrics or PNG textures with transparency into Sansar, Sansar did not recognize the transparency. Sansar’s support told me they don’t support transparent textures on clothing and that all transparent parts need to be modeled, not textured. Seems their support was wrong. Some users found a clever workaround by unzipping the .samd file and changing the texture maps. 1) Unpack the samd file and add your transparency to the diffuse file. 2) At import in Sansar click Material Setting. Official Sansar forum thread with Q&A about the transparent textures issue. In Marvelous Designer, I sometimes use a very thin piping line to add a nice rounded edge to clothing, to close off the edges of skirts and sleeves, or to fake a seam between different clothing parts to add realism. Sometimes, piping can cause issues in Sansar if it runs along the connecting edges of patterns which are sewn together and have a lot of gathers. What to do if piping goes crazy in Sansar simulation? Usually, piping which runs along the bottom edges of patterns such as sleeve bottoms, dress bottoms works fine in Sansar. I’m not sure if Sansar imports Marvelous Designer fabric physical property settings or considers them during the autorigging, however, I did notice that piping reacted very differently in Sansar depending on the Marvelous Designer physical property settings which were applied to the piping in Marvelous Designer prior to exporting it into Sansar. Marvelous Designer bad piping fabric physical property setting – too stiff. How to solve piping exploding in the Sansar simulations? 1. Try applying a different physical property preset in Marvelous Designer. 2. Remove the piping from the clothes in Marvelous Designer. Add “fake piping” instead of the real piping (see tips further down). On the subject of piping, here are some tips for clean piping in Marvelous Designer (which will affect your Sansar simulations). Image 1 shows clean piping lines which don’t overlap. Image 2 shows overlapping piping lines (which cause issues both in MD simulations and in Sansar simulations). Image 3 shows an example of an OK piping line which just decided to go mad in Marvelous Designer. To fix it, right-click on the piping line and select “refresh all pipings”. Important! Always start and end your piping lines somewhere inconspicuous such as in the back of your garment. While in Marvelous Designer piping lines are seamless, in Sansar, it is very obvious where they start and end (see examples below). In the below examples, image #1 shows an apparently seamless piping line in Marvelous Designer. This is what it looks like in MD and when you render it in a render engine. In image #2, once we click on the piping line, we see where it starts and ends. Image #3 shows what this piping line looks like in Sansar. Like mentioned above, Sansar makes it obvious where patterns are sewn together and where piping starts and ends. Not pretty. So make sure to start and end your piping somewhere less obvious (like in the back). What to do when Piping gets "Gobbled" by Sansar simulation? Sometimes, some piping which runs between patterns gets “gobbled up” during Sansar simulation. Below is an example of a Marvelous Designer dress which has a lot of piping lines on the garment as part of the design. In picture #2, after I imported the dress into Sansar and simulated on the A-pose, you can see the piping all looks fine. However, in picture #3, after simulation was finished and the avatar adjusted to a pose, some of the piping gets swallowed here and there by the fabric. What to do about piping which gets swallowed by Sansar? Sometimes, piping gets gobbled up or blows up in Sansar because it wasn’t made well in Marvelous Designer. Check your piping lines to ensure they are not overlapping and that whenever possible you have one long piping line instead of several shorter ones which meet up along the way. Other times, piping blows up because it doesn’t like to be between pattern pieces in Sansar. The easiest solution is to “fake” piping instead of using real piping for Sansar clothes. Option 1: For example, if you want a black decorative line running through the center of your garment, delete your piping line, create a thin pattern the width of your piping line (in this example 5mm) and sew the dress patterns to the thin center line instead of using piping to create the black line. Benefit of “fake” piping: You (usually) won’t get the grey/white outlines/gaps between the patterns and the piping in Sansar. In Sansar this trick of fake piping looks pretty good, almost identical to real piping (just flat, without the rounded protrusion). Option 2: Merge your dress patterns into one front piece instead of 2 (left and right) patterns. Overlay a texture image of a thin black strip in the center to make a fake piping effect. This is a good way to also avoid the grey/white lines or gaps around patterns which are sewn together. The nice thing about using the 2D graphic tool to overlay a colored “fake piping” strip, is that you can interactively scale and stretch it on your garment without having to change pattern widths and sewing. Tip: If you load in a white texture, you can change the color and specular color in the Property Editor. Option 3: Merge your dress patterns together, add an internal line along the middle (or wherever you want the piping) and then pipe on the internal line (which creates piping on top of your garment instead of between the pattern pieces). This might work in some cases, however, in this example you can see it still swallows the piping. Why do white/grey lines appear in Sansar along the edges of my patterns? Currently, Sansar has a bug which adds a grey or white outline around Marvelous Designer patterns. Mainly, it appears in the connections where patterns are sewn together but sometimes also along the bottom edges. For light colored clothes, it could look like a piping line and doesn’t stick out too much, but for darker colored clothes it is quite obvious. This “outline” appears regardless of thickness settings on the Marvelous clothes, fabric physical property settings or piping. Hopefully they resolve it soon! Meanwhile, some users find that if they export their garments at a high particle distance (such as 20) there are less or no outlines. Personally, I haven’t seen a difference between importing garments at PD 10 or PD 20. Some other users recommend to unzip the .samd file and paint over the blurred or grayed edges of the texture UV map. Quads or Tris when Exporting Marvelous Clothes? I’ve tested exporting the same garment once as a quad mesh and once as a tri mesh. The Sansar’s conversion took much longer on the quad mesh. It also took much longer to apply the garment onto the avatar. After Sansar converted and autorigged both garments, they looked almost identical apart from issues on the quad mesh. The quad mesh had more holes and parts breaking up than the tri mesh. So far from my experiments it seems best to import to import tri meshes not quad meshes into Sansar. What to do if Marvelous Designer 7 buttons open up in Sansar? If you used the Marvelous Designer button and buttonhole feature to “thread” buttons thorugh the button hole, the buttons sometimes slip out of their button hole and tangle or open up in Sansar. The way to avoid this is to fake the threading of the button. Use the MD7 button feature to add a button on the garment’s outer layer (not the inner layer) and add a buttonhole on the same layer. Then sew a round internal circle right beneath the button from the outer layer onto the inner layer. To everyone it will look like a real button which was threaded through the buttonhole while avoiding all simulation issues of buttons sliding out of buttonholes. Can I import clothes with props (extra OBJ clothing parts)? No. Additional props and OBJ models you may have added to your Marvelous Designer clothes will not be imported with the clothes into Sansar. 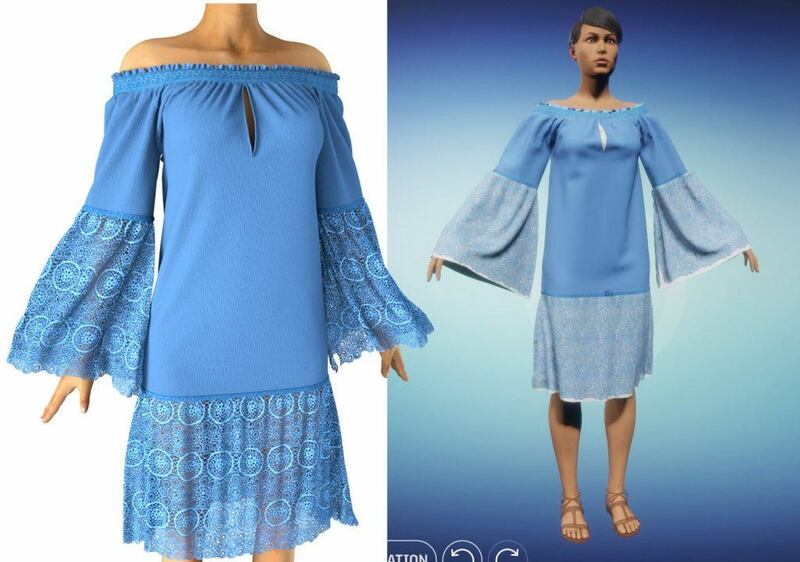 Can I import to Sansar Marvelous clothes with buttons and zippers? You can import into Sansar buttons and zippers made with Marvelous Designer 7 tools. You can’t import any custom button OBJs you may have added to your MD clothes. Why are there gaps where my seams should be? It’s a Sansar bridge bug. Many users are experiencing large gaps between their pattern pieces. Hopefully they fix this bug soon! Some users have noticed that there are less gaps between their patterns when they export their Marvelous clothes at Particle Distance 20 instead of 8 or 5. So if you’re experiencing the “Gap bug”, try exporting your clothes at a higher PD, or removing any piping lines which may be causing these gaps, or simulating your clothes again in MD and exporting them again to Sansar. Should you sell complete outfits or separate clothing items in the Sansar marketplace? While you can import and create for sale full outfits into Sansar, I recommend creating and importing tops and bottoms (pants, skirts) separately unless the outfit is something special which must be as one piece. 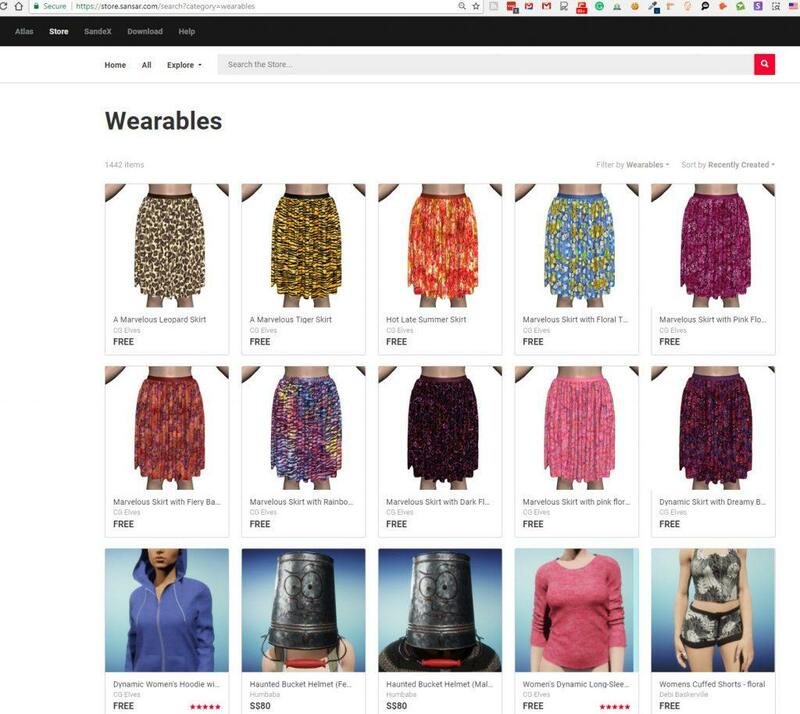 By creating separate tops and bottoms, you can list many more clothing items in the Sansar marketplace (and have better chances of being discovered) and Sansar users can mix and match clothing as they wish. Maybe someone likes your pants but not your shirt or they like the pattern on your shirt but not the one on the pants. Offering separate clothing items gives users more control over their desired look. The answer is yes, sort of, and no. I recommend you not to make Marvelous Designer clothes which have too many layers. While Sansar currently has an issue with simulating layered Marvelous Designer clothes (clothes with layers often have penetration issues of fabric poking through top layers and eating itself up, tangling up), users can layer multiple Sansar garments in Sansar. Layering 2 Marvelous Designer converted clothes is (most of the time) possible. For example, I made 2 separate Sansar garments from Marvelous Designer garments; a shirt and a pair of pants. Depending on which garment you first apply to your Sansar avatar in Sansar, the other item will either be layered over it or under it. When simulating Marvelous Designer garments in Sansar, you can tug at the layers and arrange them. Small adjustments such as tucking some of the shirt fabric into the pants, pulling the pants up over the shirt is easy. However, big adjustments such as pulling out a shirt from beneath the pants after Sansar layered it under the pants is tricky. The way to do this, is to un-apply the clothes and then reapply them in the order you want them layered. Note: Layering a Marvelous Designer garment with a Sansar garment is tricky! Rigged Sansar clothes are conforming, not dynamic like Marvelous Designer clothes, and cannot be dynamically adjusted in simulation. Sansar clothes have a certain distance from the avatar’s skin and you can’t tug them over other clothes or stuff other clothing layers under them. For example I tried to use a dynamic Marvelous Designer shirt with Sansar pants. The shirt can go over the pants, but there’s no way I can get it to fit under the pants. I tried making the bottom of the shirt skin-tight to the avatar, applying elastic etc. but it still didn’t want to stay under the pants. See image below: (Left is a shorter MD shirt, right is the longer MD shirt coming out of the Sansar rigged pants). If you want users to be able to use your clothes with other conforming or dynamic Sansar clothes, design your clothes in a way that they’ll fit with other clothes. Make shirts which are meant to either go over pants or are short and reach up to the pant’s belt. Marvelous Designer pants are much easier to use with Sansar clothes since you can layer them over Sansar clothes and pull at them to adjust them. You cannot create clothes with double-sided fabrics in Sansar using the MD to Sansar bridge. In Marvelous Designer, you can create clothes which have a different texture or color on the inner side of the fabric (this is visible and looks nice if you roll up sleeves, have an open hood, open a collar etc.). 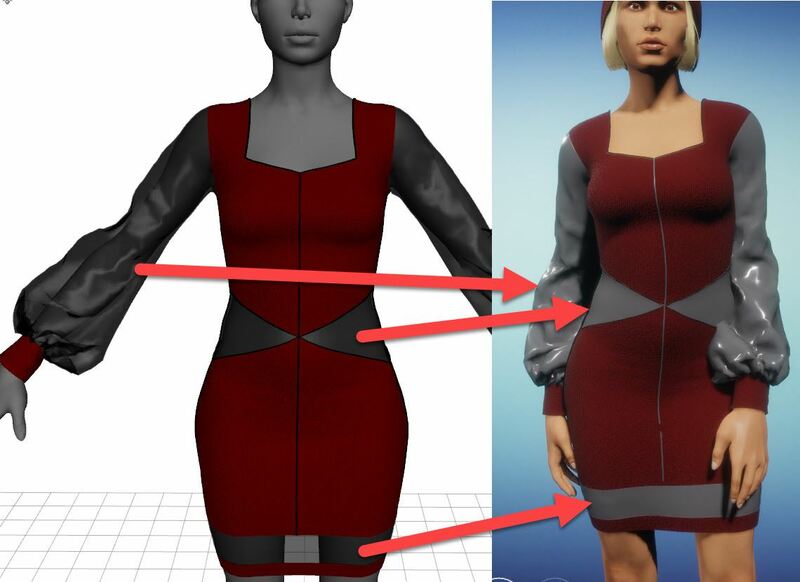 If you import Marvelous Designer clothes with double sided fabrics into Sansar, the inner side of the clothing will get the same texture and color applied as the outer side has. You cannot import props or additional avatars. So if you modeled your clothes in Marvelous and added a special belt buckle OBJ, OBJs of special custom buttons, an OBJ of shoulder pads, a 3D model of a special hook, ribbon, zipper etc. none of that will be imported into Sansar. 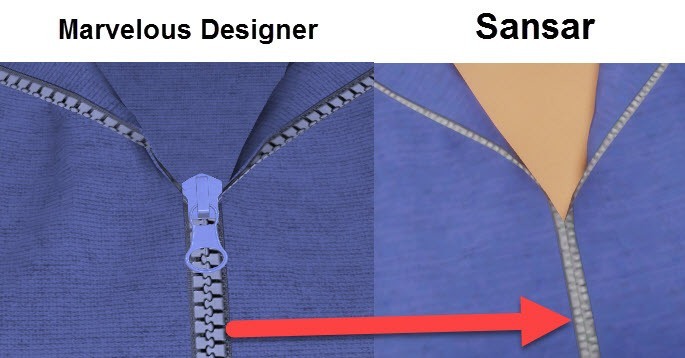 To add zipper pullers, use the new zipper feature in Marvelous Designer 7. You cannot import Marvelous Designer 7 stitches. 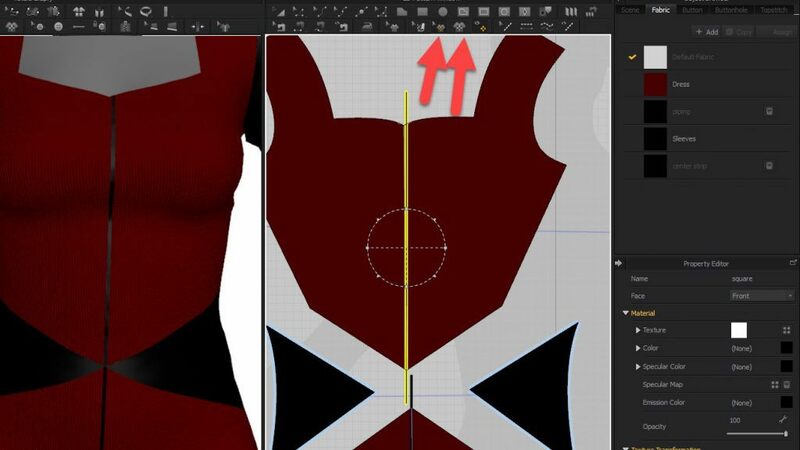 If you want a stitch design on your clothes, you need to create it the “old fashioned way” using image overlays instead of the Marvelous Designer 7 stitch tool. See my tutorial how to make stitches for Marvelous Designer clothes. Marvelous clothes come into Sansar with all the textures and image overlays so the image overlay stitches will be imported as well, however, the quality of textures and image overlays will get greatly reduced by Sansar. Sansar reduces the quality of textures, blurring them and sometimes also distorts/stretches the textures depending on how the clothing gets auto-rigged. For Sansar clothes, there’s not much point to add very fine details such as woven logos with realistic thread detail, small image overlays etc. Even the default Marvelous Designer zipper texture and my own zipper textures get greatly reduced in quality by Sansar. Fabric knit and cotton textures end up looking rather flat and blurred. Floral textures, batiks and designs look OK. 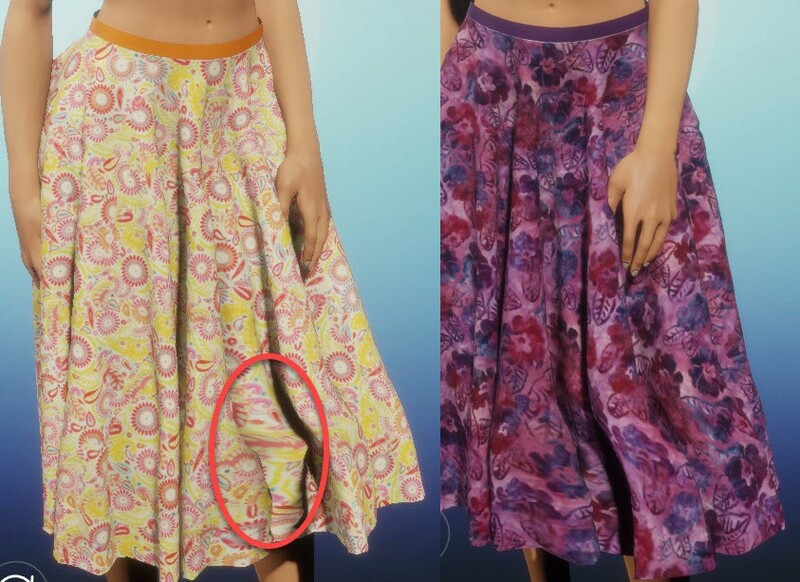 If your skirt gets auto-rigged in a strange manner such as shown above, go back into Marvelous, try readjusting the skirt’s drape, maybe moving the wrinkles apart or reducing the amount of fabric and fabric folds. You cannot import fabric thickness into Sansar. Marvelous patterns loose all thickness when Sansar converts them to Sansar clothes. Hope you enjoyed and benefitted from this page on converting 3D clothes from Marvelous Designer 7 to Sansar clothes. If you have any Marvelous Designer to Sansar questions or feedback, feel free to add a comment below!